I am obsessed with coconut oil and this range is yet again another huge HIT for Palmers in my opinion! The body oil is something I probably wouldn't normally pick up when shopping for myself - I'm always drawn more to lotions and things that I know will sink it's the skin and not leave it greasy. Well, I am so glad I've managed to try something different here as my thoughts on oils has completely changed. This stuff is lovely and perfect for popping on before leaving the house when I've got my legs out! The body lotion I have already talked about in my previous post so you can read all about that right..... here! Now the product I know that I am going to use the most - the hand cream. My hands get so, so dry - especially with the amount of hand gel I use daily. This is the perfect product to have in my handbag 24/7 and it smells divine! 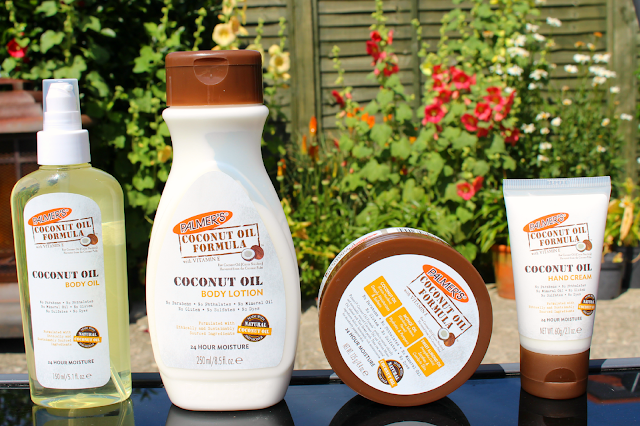 So there's a little sneak peek for you - this range is out NOW and I highly recommend it to all your coconut lovers! I am obsessed with coconut body products, so will defo need to see if they stock those here in the US, they sound delicious! Live the smell of coconut, will have to give this a try! I love my Palmers body lotion but these sounds even better! I am tempted by the oil, I love hydrating products for my skin! I feel the same about body oil, so I must try this one. These all sound lovely! I have the original palmers cocoa butter and I love it! I love that Palmers products are so inexpensive, but effective. Their other lines are amazing, so I can't wait to try some of the creams from the coconut range. It's just such a shame that the packaging isn't so nice! Wow these look fab. I have loved Palmers for years and cant wait to buy some of this range.